Data is core to high performance computing (HPC), especially for workloads such as those in life sciences, oil and gas, financial services, and media rendering. Accessing large amounts of data at extremely high speeds and low latencies is essential to HPC, but has always been a key challenge in running HPC workloads. The HPC community has long met this need using storage technologies like the Lustre open-source parallel file system, which is commonly used in supercomputers today. The nearly unlimited scale of the cloud unlocks powerful capabilities for users, while also increasing the demand for fast parallel storage. Unfortunately, the configuration of the Lustre parallel file system is typically a technically challenging and time-consuming task, and can require an expert to implement correctly. 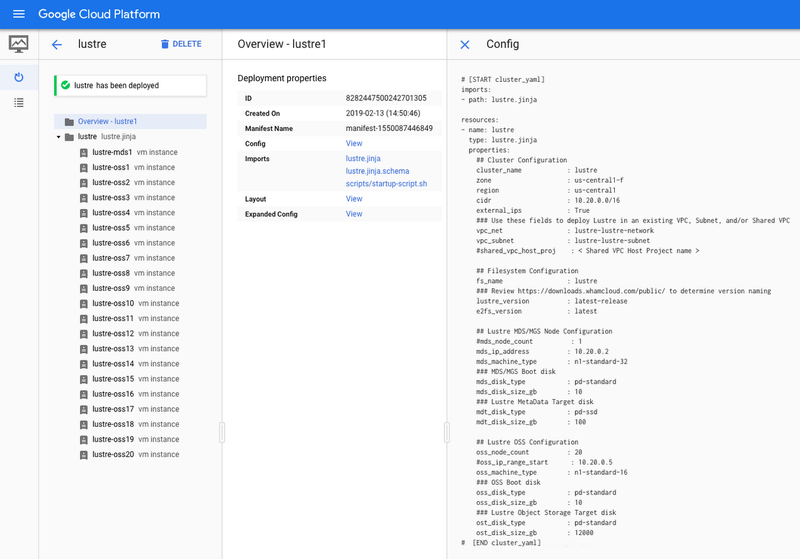 In order to simplify the complex process of building and configuring a Lustre cluster for our users, the engineers at Google Cloud Platform (GCP) have developed a set of scripts to easily deploy a Lustre storage cluster on Google Compute Engine using the Google Cloud Deployment Manager. The scripts are available here in the GCP GitHub repository, under the community directory. We’ve worked to make this as simple as possible, even if you don’t have a lot of Lustre experience. We’ll briefly walk you through how to use the scripts here. Though it’s challenging in an on-premises environment, the process to deploy a ready-to-use Lustre cluster in GCP is very simple. First, create a project to contain the Lustre cluster, and ensure that you have GCP quota available to support your expected cluster. Note: The rest of this blog post assumes you use the default values populated in the lustre.yaml file for the fields cluster_name and fs_name. If you change these values, make sure to continue your changes throughout the following instructions. VPC Network—Network to host Lustre traffic, unless an existing VPC network such as a Shared VPC is provided. VPC Subnet—Subnet to route Lustre traffic, unless an existing VPC Subnet is provided. Cloud NAT—NAT device to route traffic to the internet, unless external IPs are disabled. Firewall rules—Firewall rules will be created to allow inter-node communication, and SSH into the Lustre cluster. MDS—Lustre metadata server and management server serves the independent metadata and Lustre management functionality. OSS—Object storage server serves the file data in a distributed manner. Create operation operation-1551479420501-5830ff3bc3d08-deecdd99-0b8fe01b completed successfully. Welcome to the Google Cloud Lustre Deployment! The mount command should return quickly with no output. If you experience an issue with this step, check out the Troubleshooting section of our README.md file. You should see output similar to this that shows the Lustre metadata target(s) (MDT), the Lustre object storage target(s) (OST), the mount point, the total file system size, and used and available storage. You should see your new file testfile has been created. Change the permissions for /mnt/lustre to allow non-root users to access the file system, or enable authentication in Lustre (the Lustre User/Group Upcall is disabled in these Lustre deployment manager scripts by default, which causes Lustre to fall back to the OS authentication). Your Lustre cluster is now online and ready to host your scratch and HPC data to solve your hardest performance problems. Check out the README.md for even more detail and to learn how to expand your Lustre cluster by adding new OSS nodes. Visit the Google HPC Solutions page to read about other solutions, and try combining your Lustre cluster with some of our other solutions to begin running your HPC workloads in Google Cloud. For example, combine Lustre and Slurm on GCP to create an auto-scaling cluster with access to a powerful Lustre file system. You can also learn more about HPC in the cloud during this Next ‘19 session. To ask questions or post customizations to the community, use the Google Cloud Lustre Google discussion group. To request features, provide feedback, or report bugs, use this form.